This recipe makes three different types of sushi with a Christmas twist. A great festive snack to serve to your guests! * Step 1: Put the sushi rice into a saucepan and cook according to the instructions on the packet. This should take approximately 20 minutes. * Step 2: Cool the rice down by thinly spreading it out onto a tray lined with baking parchment. Cover with another piece then leave it on a wire rack to cool for about 10 minutes. Once this has been done divide the sushi rice into five portions to make the fotomaki, uramaki and nigiri sushi. * Step 3: Toast the nori sheets on each side briefly with a pair of kitchen tongs over a low open flame (or place under a grill). * Step 5: To make the uramaki (inside out rolls – rice outside): Cover two of the sheets with the cooled rice then place a rolling mat on top of it. Carefully turn the sushi over onto the mat so that the rice is face down. If the rice is very sticky you may need to line the mat with cling film first. Now go to step 6. * Step 6: Across the top of each, spread a layer of cranberry sauce then a layer of avocado, hazelnuts and finally a layer of cucumber. You might want to add a small touch of horseradish. Using a sushi mat roll up the sushi into a long sausage shape. Wrap it up in cling film and put it in the fridge to set for about one hour. * Step 7: To make the nigiri (round rice balls): Put a tablespoon of cooked rice into the palm of your hand and flatten it out. Now put a little bit of cranberry sauce, nuts and a pinch of horseradish into the centre. Using your hands work the side of the rice up into a ball shape. Continue with the rest of the rice and place in the fridge for later. * Step 8: To make the dipping sauce: liquidise the cranberry sauce, rice wine vinegar and mixed spice together. Season to taste and put into a small dipping bowl. * Step 9: When the sushi is set, chop each of the rolls into four pieces. 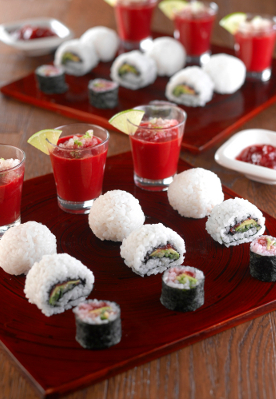 Serve the sushi on a small plate containing one of each kind. Copyright the Vegetarian Society 2011.